High Powered Laser Therapy vs. 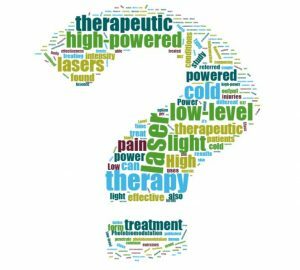 Cold Laser Therapy | Which Is Best? Navigating the world of laser therapy can be confusing and difficult. With all different names and terms out there like low level laser therapy, cold level laser therapy, and high-power laser therapy, therapeutic lasers and more, it is easy for patients to get overwhelmed and not know which treatment or laser is right for them. We’re here to clear up the confusion and help you navigate the world of laser therapy for pain and injury. Photobiomodulation therapy is a non-invasive form of light therapy that utilizes non-ionizing light sources, such as lasers, in the visible and near-infrared electromagnetic spectrum. In simple terms, it’s a type of medical treatment using light. In this article we will address the most common form of photobiomodulation therapy, laser therapy for pain and injuries. Laser therapy uses therapeutic lasers that alleviate pain, inflammation, and promote tissue regeneration. In 2014, Alves published a review finding that laser therapy, is an excellent therapeutic resource for the treatment of skeletal muscle injuries. Specifically, they found that it reduced inflammation, stimulated growth of new blood vessels, and improved muscle recovery. In 2017 a study published by the Journal of Physical Therapy Science found that laser therapy is an effective nonsurgical intervention method for reducing pain and helping the performance of daily routines of patients who have chronic pain. Under the designation of laser therapy are different classes of lasers that provide different levels of therapeutic results. In the past the most common form of laser therapy has been low level laser therapy. However, recently health care professionals have begun to use another type of laser therapy called high power laser therapy. Photobiomodulation therapy refers to all types of therapies that utilize light for therapeutic results. Many times photobiomodulation therapy and laser therapy are used interchangeably. Low level laser therapy is also referred to as cold laser therapy, low intensity laser therapy, class 3 laser therapy, and LLLT. High powered laser therapy is also referred to as high intensity laser therapy, HILT, and class 4 laser therapy. Low level laser therapy is commonly referred to as cold laser therapy. This type of laser therapy uses Class 3B therapeutic lasers with a power output of 25-500mW. Because their power output is low these lasers can take as much as 1-2 hours per treatment for simple conditions and only penetrate 0.5cm into the body. This means that the laser therapy is only able to reach superficial ligaments and nerves just below the skin. Since most pain issues stem from joints, muscles, nerve, bone, or spinal disc condition, which are located deep beneath the skin, low level laser therapy isn’t effective for most conditions. Because of this, many practitioners are starting to use high power laser therapy. High power laser therapy, also known as high intensity laser therapy, uses Class 4 therapeutic lasers with an output of 12,00mW (24 times more powerful than the low-level lasers) that can penetrate 4 cm into the body. High power laser therapy can treat all the same conditions that respond well to low level/cold laser therapy; however, it goes beyond that and can successful treat pain and injuries that low-level lasers cannot reach. The other benefits of high-power laser therapy include, being able to treat larger areas at a time, and the treatment taking a short amount of time (only about 5-15 minutes per treatment)! HILT vs. LLLT: What Does The Science Say? A 2018 a study, comparing the effectiveness of high intensity (also known as high powered) vs. low level laser therapy when treating plantar fasciitis, found that High Powered Laser Therapy was the more effective treatment. Those patients treated with High Power Laser Therapy had a greater improvement in pain levels, function, and quality of life than those that were treated with Low Level Laser Therapy. In 2013 a study found that high powered laser therapy was more effective than low powered laser therapy when treating Bell’s palsy. A 2014 study, comparing the effectiveness of high powered vs. low level laser therapy when treating knee osteoarthritis, found that high powered laser therapy combined with exercises was more effective than low level laser therapy combined with exercises. In summary, low level laser therapy or “cold” laser therapy was great when it was the only option; and it’s definitely better than not doing anything. However, since High Power Laser Therapy can treat many more conditions in less time with far better results, High Power Laser Therapy is now the best option and what we recommend for most patients. If you’re interested in trying out high powered laser therapy, submit our contact form or give us a call at 703-436-1512.